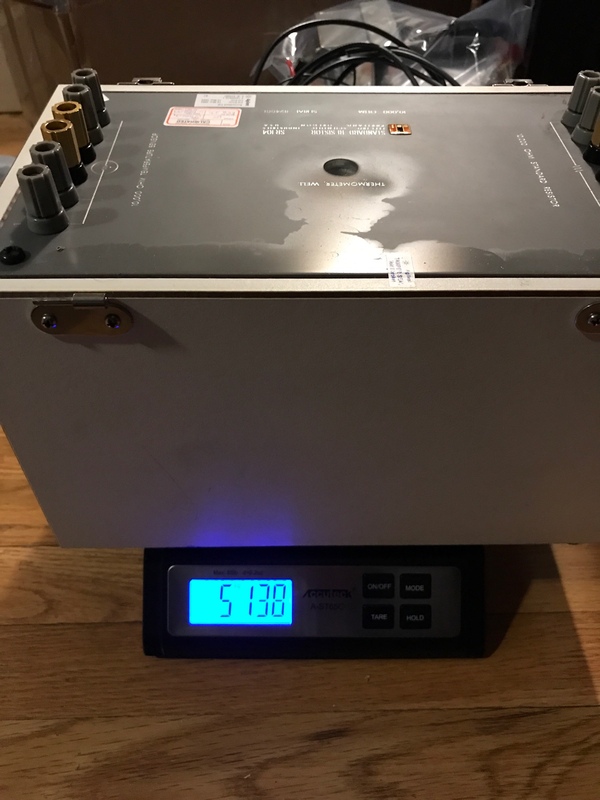 I recently acquired a used SR104 10k resistor. To my surprise it came with signs of leaking oil. See the photos. There is definitely some oil still left on the inside as I can hear it slashing and bubbling if I tilt the box a bit over 45 degrees, left then 45 degrees right. Have you ever heard about something like that? Does your SR104 make a slashing noise, if you dear to tilt it? What can I do to troubleshoot? I got a calibrated Keithley 2002 and a not yet calibrated 3458a. I measured the resistor with K2002 and it seems to have right value. I read it at +3.1 ppm. My k2002 was reading +2.7ppm low (on 20k range, same temp) during recent calibration. This makes this resistor approx +5.8 high, minus 1.7ppm 1990 adjustment, divided by 49 years (manufactured in 1968 and rated as +0.00ppm at that time) gives +0.08 ppm per year. I know using K2002 for this is very crude, but this is the best I have. Should I try to assess temperature coefficient? Monitor stability? Thank you very much. Good pickup! The one we've got at the lab doesn't exhibit the sloshing, bubbling, or signs of leaking. It definitely sounds like you've had a significant amount of oil loss. I never tore ours down, so I've only seen the insides from posts here on EEVblog. If you don't need those stickers intact, it might not hurt to investigate a little further. That was a good find and I hope DiligentMinds is correct. Your resistor is a couple of months older than mine and was just calibrated at Process Instruments. If you contact PI, they can give you a quote to measure the TCR. The pricing is competitive and about half of what IET would charge you. To check if there's enough oil in it: Why not compare the weight of the unit with the ones of the others here? Probably there's no need to use a metrology class balance. CalMachine: I am not sure, if I am ready to open mine. I saw the resistor tear down thread you are taking about. When I was poking around the web, I found the photo of the insides of SR104. I just sharpened it a bit. It is attached if anyone is interested. When looking really carefully I can see 10 of 999R475 resistors, two trimmer resistors and two black temperature sensors, in possibly Teflon stands. DiligentMinds.com: This sounds encouraging. I have a resistor laying on its side for few hours to see if there is any additional oil leak. ManateeMafia: I will look into PI. I am afraid the calibration could cost as much as resistor itself. 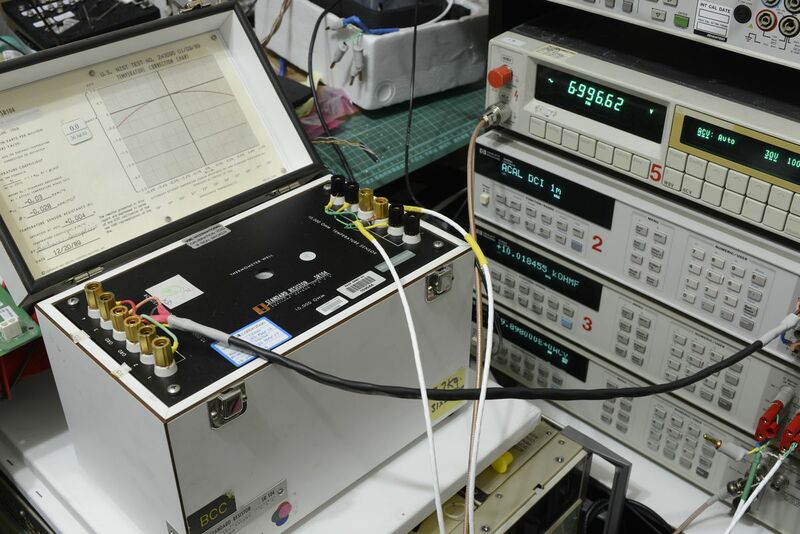 It was calibrated by Agilent in 2004. I am wondering if there is any way to get a copy of that cal certificate. Twoflower: This is a brilliant idea! I will get a reasonable scale on Monday and publish results. I have three Vishay 10K z-foil resistors with extremely stable tempco, and also 10K SR1010. I am considering measuring them against each other to tempco and stability comparison. None of the SR-104s I've used have ever had sloshing, that is not normal, brand new SR-104s do not slosh, my SR-104 does not slosh. While the oil is present for thermal considerations, imparting a large thermal mass to slow down temperature variations, the lack of 100% oil will not directly affect the resistors themselves. If the power levels are kept to a normal minimal amount, say less than 100mW as is the usual procedure, there will be no danger to the resistors. 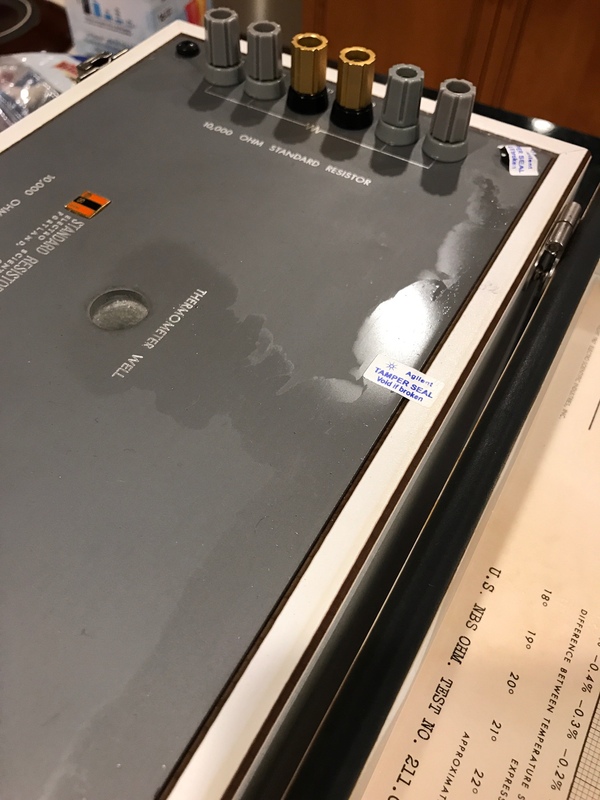 If you have a leaky SR-104 and it keeps leaking, the only alternative is to find the leak and seal it, however if you observe normal operating procedures, you will not cause any harm or change to the resistors, just expect them to react to temperature changes quicker than normal. You will have to give the SR-104 some time to stablize at whatever power level you're using since there will be reduced time lag. The lack of full oil will not affect the resistor's characteristics as such, just how fast they respond to temperature and power. The main question is why is it leaking and what caused the leak? If it was caused by dropping for instance, there is always the possibility that something inside has been affected, including one or more resistors depending on how hard the jolt was. Only time and measurements will tell. Reference the attached Vishay VHP document. On page 5, table 5 the last item is a 999.475 ohm resistor, 0.05% tolerance. Manufactured for somebody in sets of 10. From the IET product page for the SR-104. The ESI and TEGAM version of the SR-104 10k ohm standard used mica card wirewound resistors. "The NEW SR102, SR103 and SR104 are no longer designed using Evanohm-R wire but instead use 10 custom hermetically sealed oil-filled resistors. Each resistor is individually tested and then combined in sets that are matched for absolute tolerance and temperature coefficient. These sets are then allowed to age typically for several years before use. The resistors are still connected in series, parallel, or series-parallel to achieve the final resistance value. The set of 10 resistors are then hermetically sealed in the same esi stainless steel oil-filled housing. This efficiently dissipates heat into a larger mass and keeps all of the resistors at the same temperature. Each SR102, SR103 and SR104 is tested using an MI6010 and transfer standards that are calibrated annually by primary standards labs such as NRC. Typical calibration uncertainty is < 0.4 ppm." Anybody know when the changeover happened? Maybe it was a year or two after the January 2007 purchase from Tegam. I only noticed the sr10X change a few months ago. I guess they ran out of aged/stable components. Anyone know what is inside the srl series? The NEW SR102, SR103 and SR104 are no longer designed using Evanohm-R wire but instead use 10 custom hermetically sealed oil-filled resistors. Of course they ruined that too. The specification is 0.5 ppm/year but a typical ESI made SR104 shows drift almost ten times better and predictable. And continues to do so for decades and probably centuries. I recently acquired a used SR104 10k resistor. To my surprise it came with signs of leaking oil. The oil left in the thermometer well is the most likely explanation for the leakage. But if you are very unlucky, cold non-pressurised air shipping can actually crack the glass hermetic seal. Most vulnerable are the resistors manufactured prior 1972-1973 which have the feed throughs attached directly to the steel container. Brass supporting rings were added later. There needs to be some air to allow the oil thermal expansion without explosion. If you tilt it fast enough you can hear the slashing or whatever you call it. I had a chance of measuring our standard SR104 today. That is a very interesting find. The tempco in spec is much worse. I guess Tegam conditions, monitors and selects resistors for better performance. The resistor had been sent to PI cal lab to be checked out. It appears that my lid is 180 gram or 19% heavier than yours. Maybe it is bigger, or is using wood that is heavier. My resistor is from 1968. Can you guys please post ages of your resistors and their dimensions. Thanks a lot. Thank you very much everybody for your input here. Just to be sure on performance I had the standard resistor checked and calibrated with tempco (attached). If you consider the 1.69ppm change in resistance value at NIST, this resistor drifted 4.86ppm @23C in 50 years! This accounts for 0.097ppm per year. What is also interesting is that shape of the temperature compensation curve changed quite a bit from what it was 50 years ago. I am very interested if anyone else has similar comparison of how alpha and beta temperature coefficient could change. Also attached is the chart comparing original curve and newly measures one. Blue is the original from the box. Red is corrected for NIST 1990 change (moved down by 1.69). Green is newly measured. Can anyone comment if the change in tempco curve shape is typical or not? Thanks. Thanks for sharing. Now I wish I had mine tested the last go round. It almost looks like a mirror image of the original tcr curve. I guess it is possible the resistor experienced an extreme temperature event that changed its properties. If the resistor was shipped overseas, it has made at least one round trip in unknown conditions. 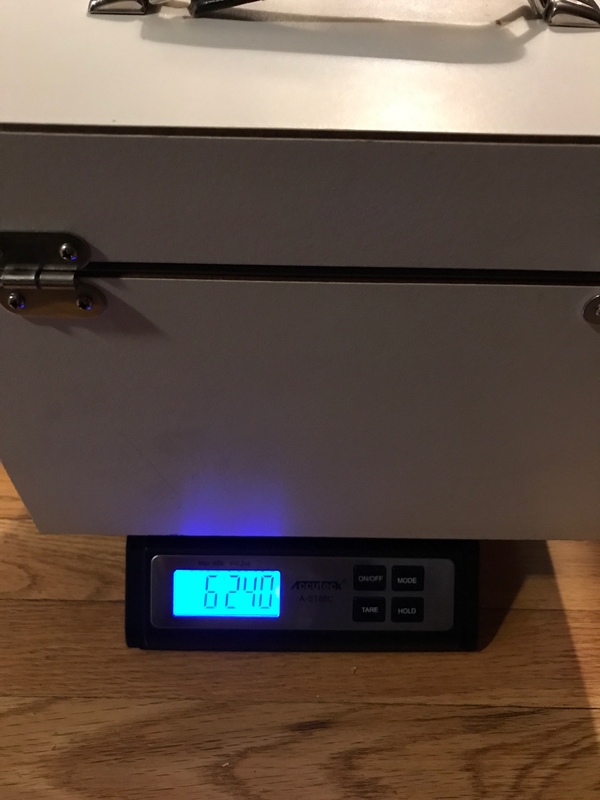 Attached to this post is my program for calculating a table of SR104 resistance vs temperature based upon the constants shown on the label in the lid. You need to edit the #defines at the start of the program with your unit's values. Assuming they select a combination of resistors so that you get zero temperature coefficient, that curve change could be explained by one of these resistors with a positive coefficient going high by 48 milliohms. Something like small valued resistor added for the purposes of trimming and temperature compensation. You could keep an eye on this yourself if you have a temperature controlled oven by just checking the curve shape does not change any further. Due to the re-defining in 1990, the absolute value would be different, but why the heck would the tempco be different? Blue line corresponds to chart on my lead cover. It actually reads 0.00ppm @ 23c in pre 1990 NIST Ohms. Since the NIST Ohm was redefined 1.69ppm higher, the same resistor would have been measured as -1.69ppm. 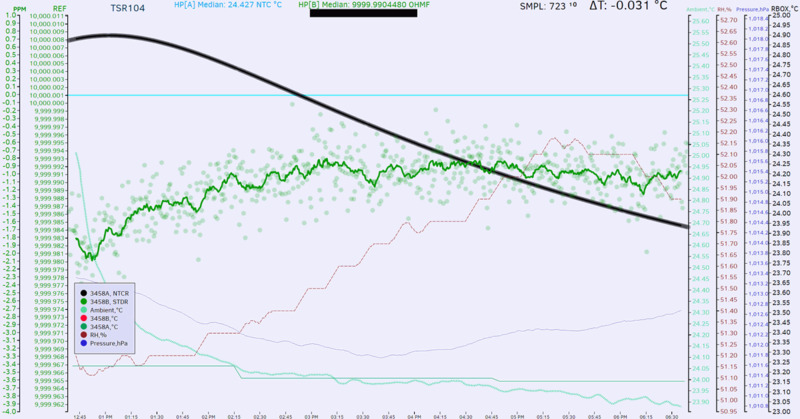 That is why the red line was moved -1.69ppm down. Since the move is exactly down, there is no change is tempco. However when tempco was remeasured 50 years later, not only the resistance at 23c changed, but the shape of the tempco curve changed too (green line). Generally this shape on Sr104 is considered to be stable, so either my unit went through some "event" or 50 years is long enough that even tempco curve drifted. 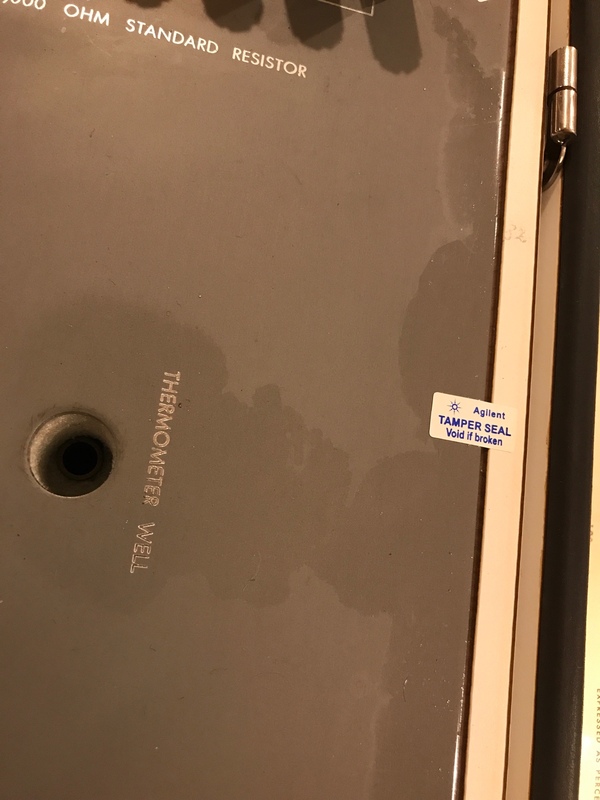 This is why I wanted to know if anyone else had their Sr104 remeasured with tempco, to see if their tempco curve changed. I've got my toy today, just delivered. No oil residues anywhere. Can't hear any flushing/slushing either. Logging started, wonder how much time will it take to relax after international trip from Australia. It supposed to be 10000.0011 ohm +/-1ppm, according to calibration in 2016. Just how accurate are your massmeters? Regular non calibrated ones , without any care taken in levelling, will be up to 5% incorrect on a tilted surface. I do have calibrated masspieces, and know the mass to 4 decimal points. Scrapped massmeters that showed a sudden offset over a certain part of the scale, load cells eventually failed on both examples of the same model in the same way, they deviated by 100g at 10kg, whereas before they were within 3g. I don't have a scale to measure weight. Initial log while resistor is sitting next to 3458As. My 3458A-2 calibrated in January 2017 in USA by fellow nut ManateeMafia, and verified since versus my rusty 3458 and 2002's. I'm impressed than actual measurement of this SR104 without any proper time to relax and stabilize from international shipping (you still see oil tank slowly cooling by black NTC reading line) is already only -1.0 ppm off the value in 2016 calibration report (10000.0011 Ohm +/-1ppm at +23.34 C well temperature). . I guess 2K$ well spent.